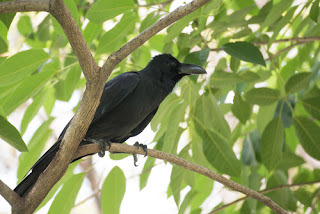 Killer Characters: Hello from Blackie—a Crow! Hey everyone! I’m so excited to talk to you today. Most people just ignore me. Some even consider me a nuisance, but like most of my fellow corvids, I’m sociable, highly intelligent, and I have a long memory. · We live in extended family units, in which the whole family cares for and teaches the young. · We can live up to thirty years!! · We have great memories, and we recognize faces. Treat me well, and I’ll be your friend forever. Treat me bad? Well, just expect to be dive bombed and scolded for the rest of your life. · That’s right. The rest of your life. We crows pass information down through the generations. If we don’t like you, we’ll teach our children not to like you, too. So be nice to me, or you’ll regret it! 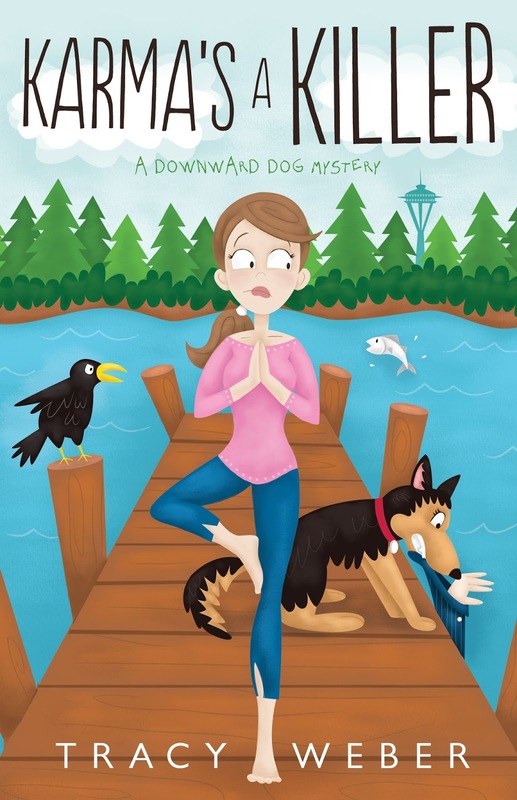 Which is why I like Kate Davidson, the yoga teacher/sleuth in Karma’s a Killer. She’s nice to me. Kate feeds me goat-shaped dog cookies. In exchange, I steal shiny objects from her. That might not seem like a fair trade, but I was raised as a fledgling before I was released back to the wild, and the best way I know to honor nice people like Kate is to take shiny souvenirs to remember them. I love being back at Green Lake Park in Seattle. I had to be away for awhile because an obnoxious off-leash dog caught me and broke my wing. I have a nasty-looking scar to prove it. All of you dog owners out there, please keep your puppies on leash! Judith, my friend and a skilled wildlife rehabilitator, nursed me back to health and returned me to my corvid family. I sure wish I could speak English. Not only was I here at Green Lake the day Kate overheard a fight between two women, but a few hours later I saw one of those women get murdered! I’ve been trying to tell Kate what I saw, but she doesn’t understand me. Bella, her crazy German shepherd, ignores me. Probably because I eat all of her cookies. If I leave Kate a clue, do you think she’ll figure it out? Tracy and her husband Marc live in Seattle with their challenging yet amazing German shepherd Tasha. When she’s not writing, Tracy spends her time teaching yoga, walking Tasha, and sipping Blackthorn cider at her favorite ale house. Hi Blackie! 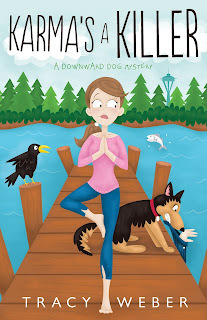 I am currently reading about your adventures in Karma’s a Killer (and it has been very entertaining). I hope to see you in the next book. Thanks for reading, Jen. Do you have any peanuts for me? I have never been mean to a crow and am glad I have not. I'm glad, too! I don't understand why people are mean to us sometimes. We're a very friendly and loyal species. And we do a lot for the world in cleaning up garbage. Best if they're not salted for me, but I will eat them either way. I'll eat just about anything. Crows are great scavengers. I love watching crows play with the wind and with each other. What a sense of humor! We can certainly be tricksters. What's life worth if it's not fun? I LOVE crows!!! They are so entertaining to watch! We crows are an active, social bunch! Crows are very smart and easily trained. they can imitate human words, much the same as parrots. We had a neighbor who had a crow for years who did this. Nice post, Blackie! A friend of yours will appear in a mystery by me this summer. Love it! We crows certainly get around. And we're great for mysteries...After all, we hang out in murders! Sure, I'll share peanuts with you! Come on over! Yum! Got any French fries to go with them? Hey, Blackie, how's it going? I've followed your adventures with Kate. She'll probably get the clue because, after all, she has shown intelligence in having you as an ally, am I right?